Katharine Morris, a class of 2020 honors student, studies Cognitive Science and Anthropology here at UConn. 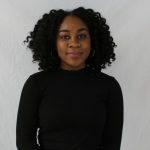 As a BOLD scholar of the 2019 Cohort, she plans to explore how students navigate their intersecting identities and engage with cultural centers on campus. As a Fast-Track MPP student, Katharine will obtain a Masters in Public Policy a year after completing undergrad. Her goal is to tackle social justice issues through policy work and ultimately become a professor of Cognitive Anthropology to bridge the gap between research theory and application. She also plans to join the Peace Corps before diving into the world of academia. Works in the Health Education Office and presents around campus on Bystander Intervention as a Pack Leader for Protect Our Pack!